Anglers from all over the world have come to fish the White River this season. 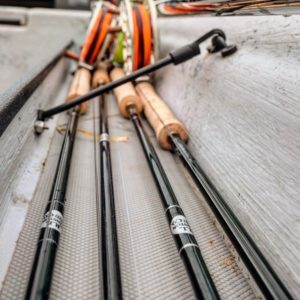 Each morning the boat ramps are lined with trucks and boat trailers, anglers are threading sinking lines through the eyes of their favorite streamer stick, and bucktail, marabou and stacked deer hair dangle from leaders as anglers prepare in the hope of turning a monster. The White has almost 100 miles of trout water, the upper fifty being the most popular for targeting bigger fish. The river bottom is gravel with deep limestone veins. The banks are a mix of undercuts, sweeping grass beds and timber. The fallen hardwoods and huge boulders make perfect hideouts for an apex predator. Rainbow trout, sculpins, creek chubs, crawfish and countless other baitfish make for a diverse menu of offerings. Bull Shoal Dam’s two priorities early in the year are flood control and power demand. 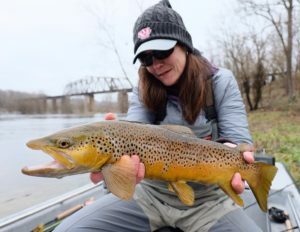 With December being one Arkansas’s heaviest rainfall months, and January and February holding some of the coldest temperatures, these conditions align for amazing streamer fishing, and a White River phenomenon called the “Shad Kill”. The shad that inhabit Bull Shoals Lake push into deep water, specifically looking for the thermocline as the surface temperature cools. The increased power demand from the colder temperatures and rising lake levels increases the need for water release. During this time of high release, the shad get sucked through the turbines and are left stunned floating on the river’s surface. As fun as it is throwing huge streamers on sinking lines, there is nothing like catching a trout on a floating minnow pattern. Watching a giant brown sip a stunned shad minnow like a caddis is a truly unique experience. Once the gulls start dipping and diving, it’s the signal that the shad are in the river. Next thing you know, the sun is reflecting off all the shad’s silver skin like little mirrors and the frenzy begins. My favorite shad kill rig includes a floating shad pattern while suspending a white marabou jig fly below it. I’ve watched trout fight to get to the flies. Depending on how big the burst is, the shad kill could last for a few minutes or all day. The Shad Kill is truly one of the wildest things in trout fishing I’ve ever seen and another unique aspect of fishing the White. If shad are not being spit from the dam, streamers are the name of the game. This game isn’t for fair-weather anglers. Big water streamer fishing is mentally and physically taxing. Seven and eight weight rods are the norm with full sinking lines and 4-8 inch flies. 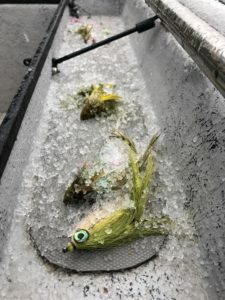 Challenges like fly line freezing to the stripping guides, numb hands, and chilling jet boat rides all become part of the game. Some days it’s certainly a “hero or zero” game, but the more casts that fall accurately into pockets, seams and undercuts, the more an angler will get rewarded. 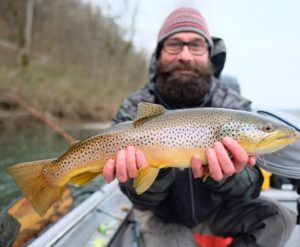 Arkansas’s tailwaters have held three world record brown trout, and I feel confident there is another one out there. Next time you’re thinking about planning a trout fishing trip, maybe think about the Natural State as your destination. We have a never-ending season, and each month is uniquely different. The Ozarks are one of the oldest mountain ranges in the country and our southern hospitality is second to none. Oh, and did I mention the trout eat floating shad? Matt’s recommended Winston Rods for hucking meat on the White: Boron III Plus 6-8 weight, Saltwater Air 6-8 weight. Matt Millner is the owner of Rising River Guides, based out of Cotter, Arkansas. Matt began his guiding career in 2006 in central Arkansas on the Little Red River, home of the world’s record brown trout from 1992-2006. His passion for conservation and teaching radiates out of him. If you’re interested in learning more about southern trout fishing check out www.risingriverguides.com.